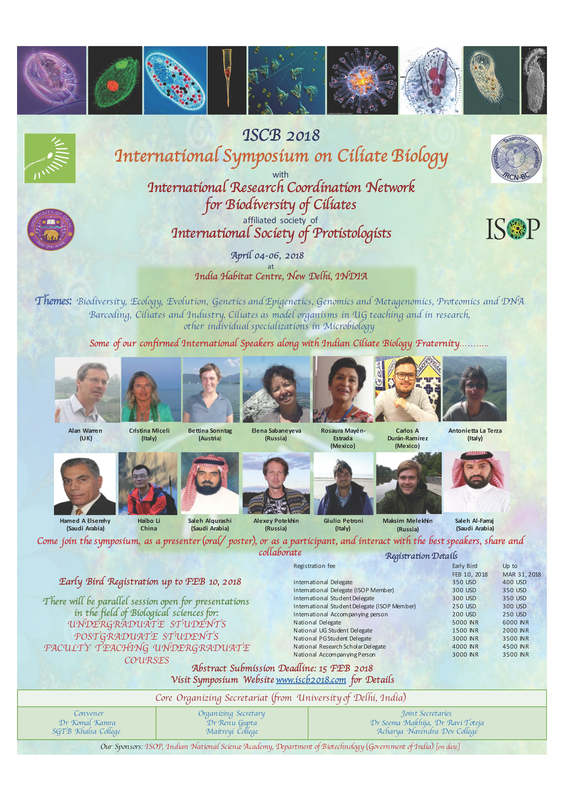 Three constituent colleges of University of Delhi (Acharya Narendra Dev College, Maitreyi College and SGTB Khalsa College) are co-organizing International Symposium on Ciliate Biology (ISCB 2018) in April 2018. Members of the Core Organizing Secretariat of the ISCB 2018 with International Research Coordination Network on Biodiversity of Ciliates (IRCN-BC) invite you to the ISCB 2018 to be held at India Habitat Centre, New Delhi, India, from 04 to 06 April 2018. The International Society of Protistologists (ISOP) has graciously granted partial financial assistance for the same under the guidelines for funding affiliate societies for seminal activities. We thank them for the same. It will be an honor and privilege for us to have you, your colleagues and students to participate in the symposium. The symposium shall have oral and poster presentation options. The symposium will also include a separate session for undergraduate students of bio-sciences. Only original research work will be accepted for all presentations. Only registered participants can be presenters. The last date for registration and abstract submission is January 31, 2018. This will help us to structure the symposium programme and make arrangements ahead of time. Themes: Biodiversity, Ecology, Evolution, Genetics and Epigenetics, Genomics and Metagenomics, proteomics and DNA barcoding, Ciliates and Industry, Ciliates as model organisms in UG teaching and in research, other individual specializations in microbiology.